Many regulations that have been put in place are forcing companies to use them in order to protect their clients’ privacy. There is no excuse for not having a full compliant email disclaimer in all organizational email signatures. Make sure the emails your organization sends are protected against legal threats with these top 5 email disclaimer tips. For sensitive emails, it is advisable to add a confidentiality header that states for whom the message is intended. The confidentiality notice should be included at the top of the email, since it will be the first thing a recipient will read. Putting the notice at the bottom of the email, where the email signature is located, will mean that the person needs to read the email first, only after which they are possibly informed that they were actually not allowed to do so. It is a good idea to include a different email disclaimer for each department since different issues apply. This means including different variants of your disclaimer in each department’s email signature. For instance, the sales department might need to include a notice in their email signature that all quotes are valid for 30 days and that the company’s terms and conditions apply to all orders. Financial departments, on the other hand, will send more sensitive messages and would require an email disclaimer to stress the confidentiality aspect. The internal disclaimer should be different from an external disclaimer. For instance, for internal mail, the virus and contact issues are not so relevant, but the confidentiality and employer’s liability aspects are all the more important to disclaim against. 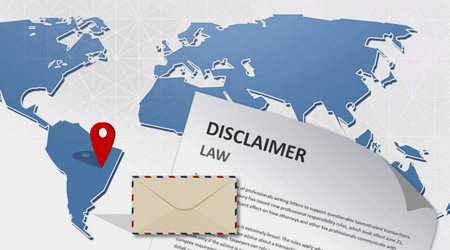 You can include a global internal disclaimer, or you can create user/departmental based internal disclaimers. Certain users, such as directors and supervisors, might require an email disclaimer according to their personal job function. Also, users that frequently send attachments might need a more pronounced warning about viruses in email transmissions. Depending on the message's sensitivity, you can choose to prepend or append an email disclaimer. Prepending disclaimers is best for sensitive emails and appending disclaimers is best for ‘normal’ emails. 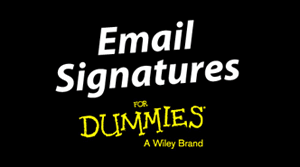 For more top tips on the email disclaimer, get a free copy of our Official Email Signatures for Dummies Guide.